Blue Bell/Pottstown, PA —Area military veterans now have a creative outlet to share their experiences with people who understand them best – fellow veterans. This fall, the Montgomery County Community College West Campus in Pottstown will offer a new course, English 265 HYBW2, also known as Intro to Creative Writing for Veterans. The course is limited to guest veterans from the community and current MCCC veteran students. The three-credit course, which was created by Susan Buchler, assistant professor of English; and Denise Williams, veterans’ resource specialist, will be held on alternating Monday evenings. The workshop setting of the course will include sharing written work such as creative non-fiction, short stories and poetry, and discussing select pieces of literature that are relevant to the course theme – freedom through writing. The course also includes an online component. Buchler, who has had several veterans in her writing courses at MCCC over the years, said the philosophy of the course is to help make the process of writing less threatening, and to create an atmosphere for veterans where there is a shared bond and trust. The 15-week course runs from August 30 through December 19 and will be held from 6 to 9 p.m. in South Hall 249 on the MCCC West Campus at 101 College Drive in Pottstown. For more information contact Williams at dwilliam2@mc3.edu or Buchler at sbuchler@mc3.edu. To register, visit http://bit.ly/2oud0Qs. Montgomery County Community College is recognized by Military Times as a Best for Vets College, and G.I. Jobs magazine named MCCC a Silver Medal Military Friendly school. The Veterans Resource Center at MCCC, with offices on the Central Campus in Blue Bell and on the West Campus in Pottstown, serves more than 450 veterans, service members and spouse/dependents with their transition to college. For more than 50 years, Montgomery County Community College has grown with the community to meet the evolving educational needs of Montgomery County. The College’s comprehensive curriculum includes more than 100 associate degree and certificate programs, as well as customized workforce training and certifications. Students enjoy the flexibility of learning at the College’s thriving campuses in Blue Bell and Pottstown, at the Culinary Arts Institute in Lansdale, and online through a robust Virtual Campus. As an Achieving the Dream Leader College, the institution is positioned at the vanguard of national efforts to increase completion, improve learning outcomes, and remove barriers to access for students. The College is also recognized regionally and nationally for its sustainability leadership, work with military veterans, community service and service learning opportunities, and use of classroom technology. For more information, visit http://www.mc3.edu. Blue Bell/Pottstown, PA — Long after their time in the military, the stories of Montgomery County Community College (MCCC) veterans will live on, inspiring and educating future generations. That is the goal of the College’s Veterans Coordinator, Mike Brown, as well as his colleagues from the Veterans Resource Center. During the fall semester, Brown began interviewing and capturing audio recordings of student veterans as part of the Veterans History Project of the American Folklife Center. In all, Brown recorded the stories of 10 veterans so far. He plans to record the stories of many more of the College’s roughly 300 student veterans. Recordings will be permanently archived at the Library of Congress, where all recordings have been housed since the Veterans History Project began in 2000. Recordings are searchable online by war, military branch, the contributor’s name and various other search criteria. The interviews, which must be a minimum of 30 minutes and generally span 45 to 90 minutes, cover the veterans’ early life, including where they are from, why they joined the military and details of their enlistment. While many who participated so far fought in combat zones, Brown said that is not required. The College’s involvement in the nationwide effort is open to any and all veterans – even non-students. One of the student veterans, for instance, interviewed his grandfather, a Korean War veteran, as well as his father, who is a Vietnam War veteran. Sgt. William Keller, a business management student at Montgomery County Community College and an Army reservist coming up on eight years of service between the Army Reserves and the National Guard, said the recordings give the public a “more intimate” look at military life. Blue Bell, Pa.—This spring, the Montgomery County Community College (MCCC) Foundation and the College’s Division of Business and Entrepreneurial Initiatives will pilot an exciting program designed to support and mentor aspiring entrepreneurs. The Karen A. Stout Start-Up Accelerator Fund, named after MCCC President Emerita Karen Stout, will allow qualifying entrepreneurs to compete for cash awards to help them launch or grow their business ventures. The pilot is funded by a generous, anonymous donation up to $100,000, which will be used to fund cash awards in May and October. Interested entrepreneurs should submit their business plans online at mc3.edu/startup by March 30, 2016. Qualifying applicants will then be invited pitch their business concepts to a review team at MCCC’s Central Campus, 340 DeKalb Pike, Blue Bell, in May. Select entrepreneurs will be awarded between $1,000 and $20,000 to help launch their business ventures. Those recipients will work with MCCC’s Center for Entrepreneurial Studies and community mentors to set key milestones and deliverables and to monitor progress and outcomes. MCCC will offer second round of funding in October to complete the pilot year. For information, visit mc3.edu/startup. 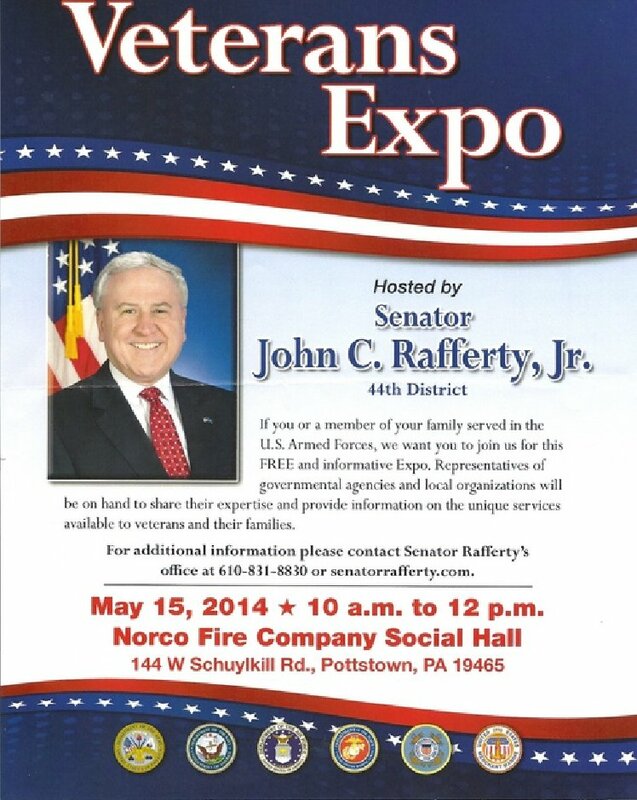 Blue Bell/Pottstown, Pa.— Making the transition from military to civilian life can be challenging for many veterans. Introducing college into the mix can make that transition even harder. While key services like veteran-specific orientation and advising can help veterans start their academic careers on the right foot, many challenges they face go beyond homework and test scores. For the sixth time, Victory Media has designated Montgomery County Community College (MCCC) as a “Military Friendly School,” positioning the institution among the top 15 percent of colleges and universities in the country for its veteran support services. MCCC takes its commitment to student veterans a step beyond orientation and advising—although those services are part of the mix. A Veterans Resource Center, located in a small, renovated farmhouse at MCCC’s Central Campus in Blue Bell, plays an important role in the lives of the institution’s veterans. Here, students can meet with Veterans Services staff, participate in study groups and tutoring, and build an important support network with their peers. For student veteran Joe Long, having such a network made a world of difference. Long and other student veterans shared their experiences with the MCCC community during a Veterans Day panel discussion in November. “It’s challenging to fill the time when no one is telling you what to do. I didn’t know how to be on my own, how to be a student. It’s why I wasn’t successful the first time I came back [to college],” shared Long, who served as a firefighter in the U.S. Air Force. Today, with a supportive network he built at MCCC, Long is a successful engineering major and works part-time as an assistant in the VRC. “For me, it started by stumbling on to another veteran in one of my classes, then going to the Veterans Resource Center, then being more active on campus by getting involved in the veterans club,” he shared. The Student Veterans Organization meets weekly in the VRC and functions like a student club. The group engages in advocacy and education around veterans’ issues and participates in a variety of community service opportunities. This fall, the SVO partnered with MCCC’s Student Nurses Club to tag and donate Trees for Troops. Members have also been working with Shamrock Reins, a non-profit organization in Pipersville that provides equine assisted activities and therapies for veterans, active duty and reserve service members, first responders and the families of veterans, military personnel, first responders and fallen heroes. MCCC also thinks outside the box when it comes to positioning veterans for success. For example, the College offers free yoga and meditation sessions each semester for student and community veterans. Also, this spring, Psychology faculty members Dr. Anne Marie Donohue and Dr. Deb Greenspan will team-teach a special Intro to Psychology (PSY 101) course section for student veterans. The Psychology department will also partner with the SVO to offer a Veterans Mindfulness Retreat for 20 students. Veteran enrollment at MCCC has more than doubled over the past decade, with 505 veterans enrolled this fall. To learn more about Veterans Services, visit http://www/.mc3.edu/student-resources/vrc. Blue Bell, Pa.—Montgomery County Community College (MCCC) is offering free yoga and meditation classes this fall for veterans in Parkhouse Hall room 128 at its Central Campus, 340 DeKalb Pike, Blue Bell. The classes are open to all veterans in the community. “Research shows us that mindfulness-based practices, like yoga, have many benefits for veterans. These include increasing one’s ability to focus, improving sleep and managing stress,” explained Dr. Deb Greenspan, associate professor of psychology at MCCC. Greenspan facilitates the sessions along with Sara Erlbaum of Still Warriors. Together the two lead veterans through a combination of yoga and iRest®, a guided meditation practice designed to heal and provide coping mechanisms for stress. This fall, classes will be held on four Mondays, Oct. 12 and 26 and Nov. 9 and 23, from 12:30-1:15 p.m., and on four Saturdays, Oct. 10 and 24 and Nov. 7 and 14, from 9:30-10:30 a.m.
No prior yoga or meditation experience is required, and yoga mats and blocks will be provided. 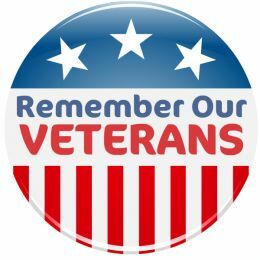 Veterans are welcome to attend one or all classes, as their schedules allow. For additional information, contact Deb Greenspan at dgreensp@mc3.edu. Lehighton, Pa.—Members of the Student Nurses Club and Student Veterans Organization from Montgomery County Community College (MCCC) traveled to Bustard’s Christmas Tree Farm in Lehighton, Pa. on Sept. 30 for the selection of the 2015 official White House Christmas tree. During a special press event, White House officials, along with representatives from the National Christmas Tree Association, identified a 19-foot Fraser Fir that will soon be headed to the White House’s Blue Room. Bustard’s was selected as the provider for this year’s tree after being named Grand Champion at the National Christmas Trees Association’s biannual meeting, held this past summer in Illinois. The Bustard family invited MCCC students to be part of the ceremonial tree selection at its Carbon County farm to recognize the Student Nurses Club’s commitment to the national Trees for Troops program. Over the past several years, the Student Nurses Club has raised funds and has donated more than 60 trees to Trees for Troops, which provides holiday trees to the families of deployed service men and woman. 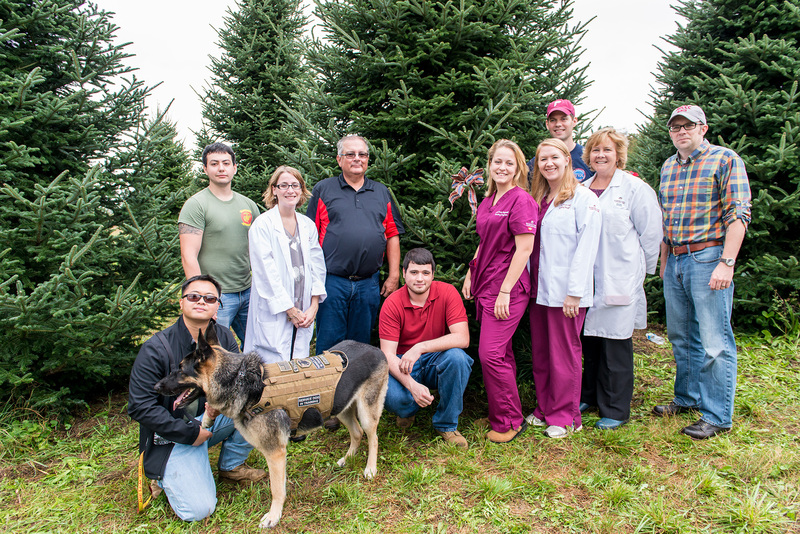 Each December, MCCC Nursing and Veterans students gather at Bustard’s Christmas Tree Farm in Lansdale to purchase, tag and prepare trees for shipment to military families. The Nursing program’s participation in Trees for Troops aligns with Joining Forces, a national initiative calling on Americans to rally around service members, veterans and their families and to support them through wellness, education and employment opportunities. To learn more about Joining Forces, visit http://www.whitehouse.gov/joiningforces. In addition to Trees for Troops, the Student Nurses Club raised over $3,000 for last year’s Hometown Hero Walk in Lansdale, and the group has sponsored donation drives for personal care items that were delivered to military troops stationed abroad and to the Veteran’s Center of Montgomery County. To learn more about national Trees for Troops program, visit http://www/treesfortroops.org. This Friday we open our award-winning drama, “WELCOME HOME, SOLDIER”, a tribute to Vietnam Veterans which tells true stories of how veterans were treated when they came home from that war. It plays in the Philadelphia area for TWO UPCOMING PERFORMANCES and we hope you will join us and help spread the word. All Veterans, but especially Vietnam Veterans, need to see this play! It has been running for 24 years in Los Angeles, and many veterans have attended dozens and dozens of times. It’s an important story you won’t hear or see told anywhere else. FRIDAY, MAY 29, 8 p.m.
SUNDAY, JULY 12, 2 p.m. Sponsored by State Representative Quigley’s Office, Montgomery County Community College, the Mercury, & TriCounty Community Network.